Laboral Kutxa Vitoria Gasteiz survived a dramatic affair to edge Olympiacos Piraeus 96-89 after overtime for its first win of the Turkish Airlines Season. 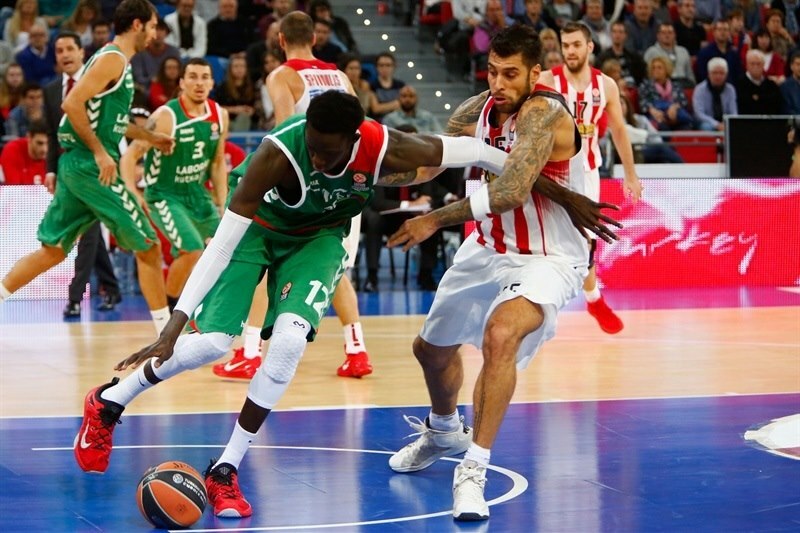 Former Olympiacos center Ioannis Bourousis shined with 27 points, 12 rebounds, 3 assists and 2 blocks to carry the hosts, who improved to 1-1 in Group C. Laboral led for much of the night and seemed to have everything under control at 61-49 midway through the third quarter. However Matt Lojeski kept the Reds alive and Vangelis Mantzaris buried some big shots too as Olympiacos rallied to take the lead in the fourth. With the game tied in the final 10 seconds, Mike James missed at one end, Vassilis Spanoulis missed at the other and James had barely enough time to dribble and bank in what appeared to be a game-winner from midcourt. However after the referee’s review, it was clear the shot was not attempted before the buzzer and the game went to overtime. 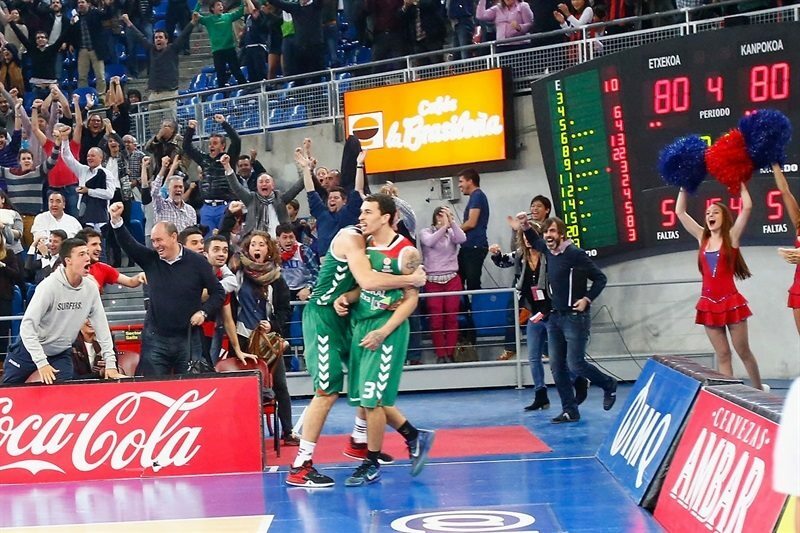 There Bourousis and Fabien Causeur stepped up to send Laboral to victory. 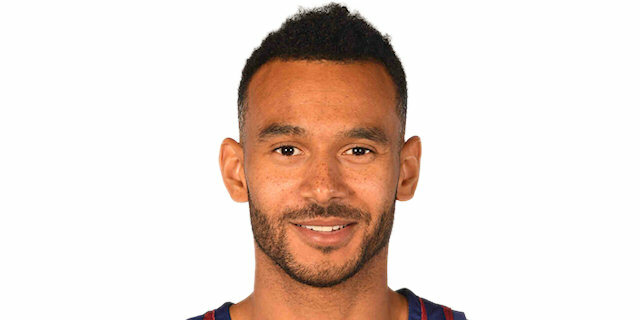 Adam Hanga added 16 points for the winners and James finished with 13. 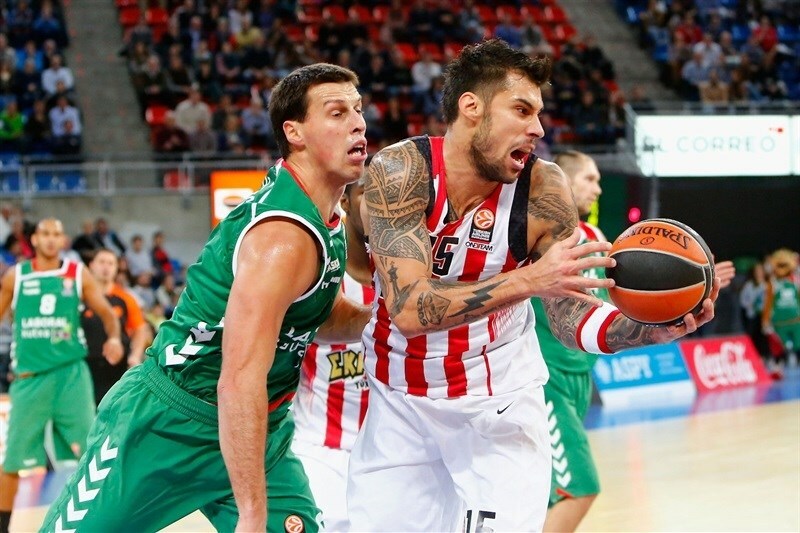 Lojeski amassed 28 points for Olympiacos, Mantazris scored 13 and Spanoulis and Georgios Printezis added 11 each. Vangelis Mantzaris got Olympiacos going with a turnaround jumper, which Darko Planinic matched with a jump hook. Spanoulis found Georgios Printezis for a dunk and a close basket by Hanga tied it at 4-4. 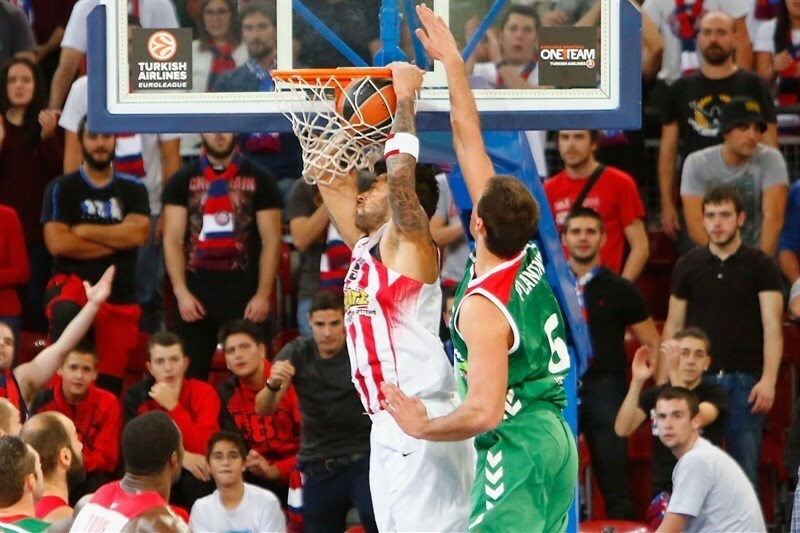 Spanoulis kept pacing the Reds with a driving layup and fed D.J. Strawberry for a fast break basket. Fabien Causeur scored in penetration and a layup by Hanga tied the game again, 8-8. Lojeski stepped on court and immediately delivered with a corner triple, but Darius Adams quickly answered from downtown and free throws by Planinic gave Laboral its first lead, 13-11. Othello Hunter stepped up with a three-point play and a turnaround jumper, but a second-chance basket by Bourousis kept the hosts within 15-16. Hunter shined with a tip-in and a three-pointer by James tied it at 18-18. Bourousis split foul shots and an off-balance basket by James gave Laboral a 21-18 edge after 10 minutes. 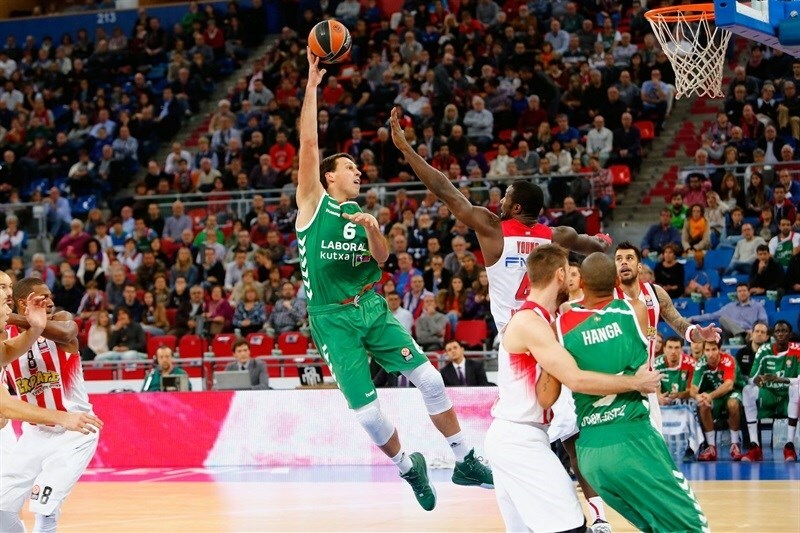 Bourousis kept shining with a tip-in early in the quarter and a three-pointer by Kristjan Kangur caused Olympiacos to call timeout at 26-18. Daniel Hackett shined with a fast break basket, which Hanga erased with a driving layup. Spanoulis found Lojeski for a layup, which Hanga bettered with a catch-and-shoot triple from the corner. A tip-in by Kangur soon gave the hosts their first double-digit lead, 33-23. Lojeski struck from downtown and a free throw by Printezis brought the Reds a bit closer. 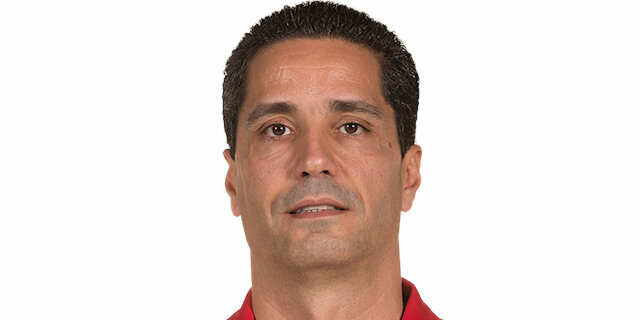 After Alberto Corbacho buried a three-pointer, Printezis hit his trademark jump hook and free throws by Spanoulis made it a 5-point game. 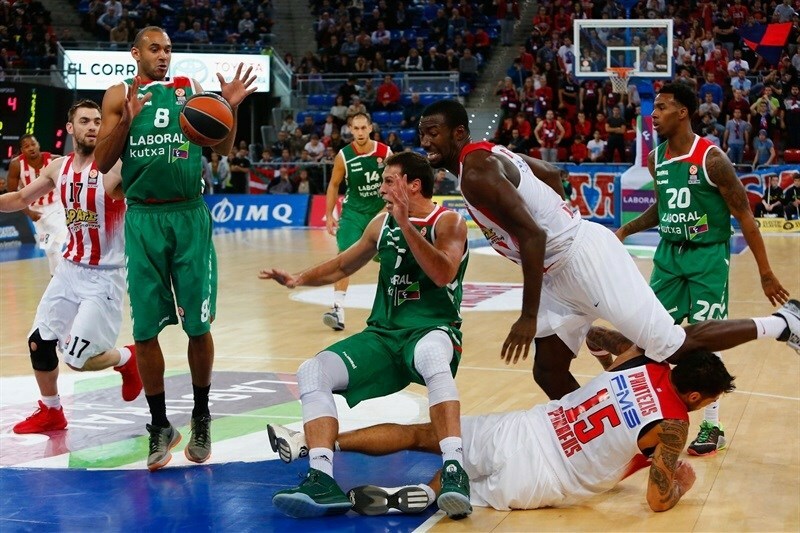 Bourousis took over with a wild power basket, but Spanoulis quickly answered with a layup in transition. Free throws by Adams gave his team a 40-33 lead. 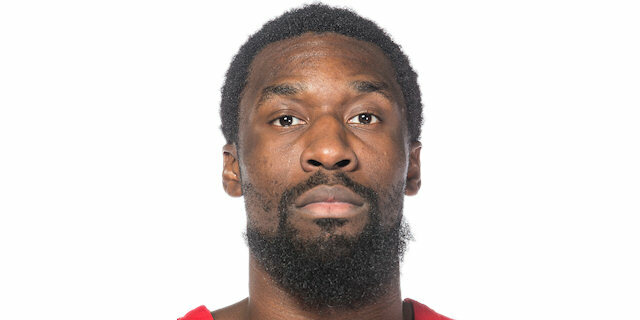 Patric Young dunked before Ilimane Diop answered with an alley-oop slam. Back-to-back three-pointers by Bourousis ignited the crowd and gave Laboral a 48-39 margin at halftime. Both teams struggled to score after the break until Lojeski provided a highlight with a fast break slam. Causeur made free throws, but Lojeski did even better with a three-pointer. Causeur scored off an inbounds pass and a running three-pointer by Adams kept his team out of trouble at 55-44. A close basket by Kim Tillie soon caused Olympiacos to call timeout. Lojeski stayed on fire with a bomb from downtown, but Bourousis hit a wild turnaround jumper and added a jump hook for a 61-49 advantage. After Lojeski made free throws, Jaka Blazic sank a corner three-pointer. Printezis kept the Reds within 64-53. Lojeski struck again from downtown, but so did James off a Laboral timeout for a 67-56 lead. D.J. 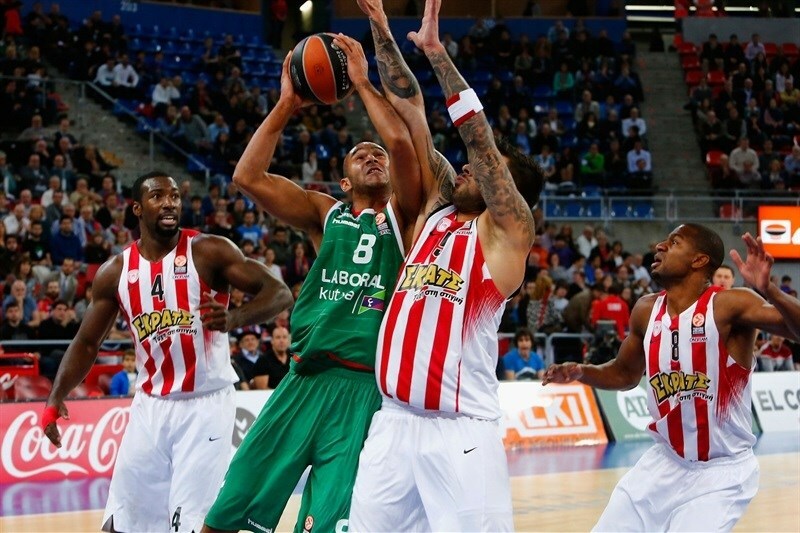 Strawberry shined with a layup-plus-foul and soon added a jumper to give Olympiacos plenty of hope at 67-61. Free throws by Nikola Milutinov and a mid-range jumper by James fixed the score at 69-63 through three quarters. 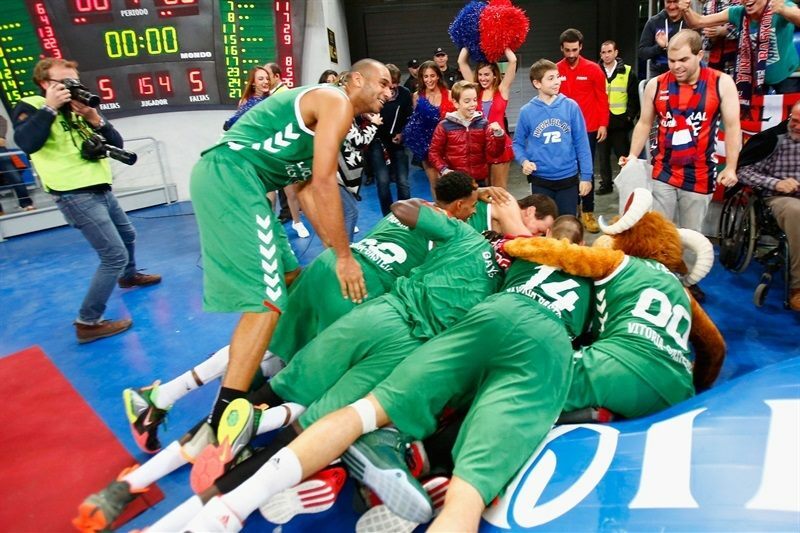 Fourth quarter: Outcome decided AFTER final buzzer! Both teams went scoreless in the opening two minutes, as Olympiacos missed a couple of easy shots that would have brought the Reds back in the game. Laboral kept struggling to score and a free throw by Lojeski made it a 5-point game. Bourousis made free throws, but Mantzaris did better with a triple from the right wing and Spanoulis added free throws that brought the guests within 71-70 with six minutes left. 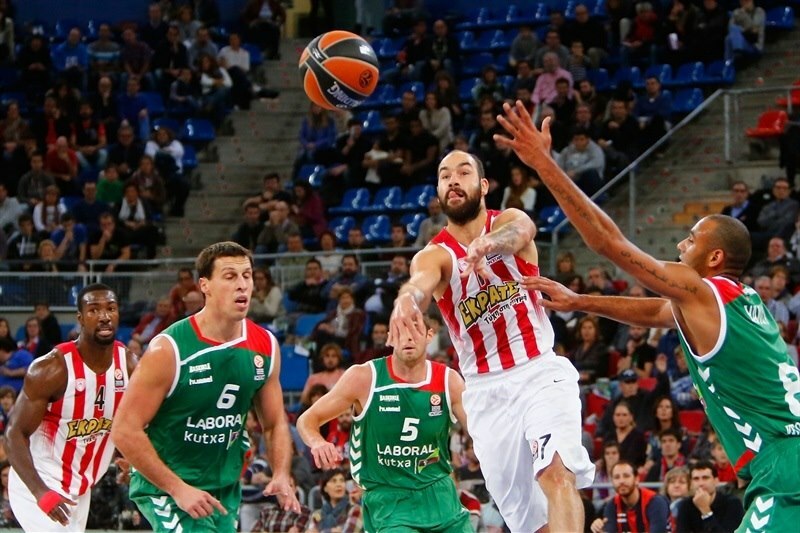 Spanoulis took over with a five-meter jumper off the dribble to complete the guests' comeback. Bourousis hit free throws and a fast break layup by Hanga restored a 75-72 Laboral lead. Laboral improved its defense when it mattered most and free throws by Tillie gave the hosts a 77-72 lead with over two minutes remaining. But Mantzaris buried a big triple and Lojeski copied him right after that for a 77-78 Olympiacos edge. Hanga scored off the baseline and a free throw by Bourousis gave Laboral a 80-78 edge with a minute left. Printezis hit a jump hook to tie it. After James missed from downtown, so did Spanoulis. James got the rebound and hit an unbelievable three-point shot from midcourt that would have won it, but after a referee’s review, it was ruled to be after the buzzer. Lojeski opened the extra session with a baseline jumper before Hanga countered with a triple. Printezis gave the Reds an 83-84 edge with 2 free throws, but Causeur countered with a triple and Bourousis added a hook shot. Causuer stole the ball from Strawberry and Bourousis drew Hunter’s fifth foul and added 2 more free throws for a 6-point cushion with 1:20 remaining. Mantzaris stepped up with a big three to halve the deficit only to see James raise the roof with a triple. Mantzaris drove baseline for a key layup to keep the Reds alive at 93-89. Back at the line, Bourousis connected twice, before Bourousis came up with a steal. Hanga’s free throw with 17.8 seconds left wrapped up the victory. "It was a great win against a team with big names and great quality. This gives us confidence in what we do, and lets us believe we can play good basketball and fight against anyone. I think we played well almost the whole game. We had some bad moments, but more because of our opponent's quality than because of playing bad. We did a good job defensively, in general, we put their offense in trouble, and when we feel we have a good level defensively, we can build good things in offense. We fought the boards, we put in intensity. 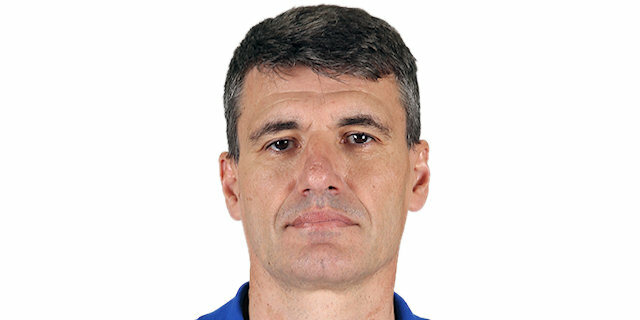 All the players contributed tonight, when you beat a team like Olympiacos it's because many players were at high level. It's not enough to have just one player." "It was a very intense game. It was more an offensive one than a defensive one. I think our biggest problem was defense, especially in the first half when we allowed too many easy points. That made it very difficult and reduced our chances to win. We played better defense in the second half, especially in the last period and limited them to just 11 points. We got the lead twice, but some crucial shots gave them the lead back and even though we had the shot to win the game, we went to overtime. In the extra time they put in a bigger effort, scored some transition points and that was enough to win the game, so congratulations to them. We lost a battle, but we will keep working to improve. " "It was a very important game, that we grabbed in the overtime. You cannot relax against them a single second. When you do that you can lose everything in only a couple of minutes, and when they find a player that is hot, like they did tonight, you find a lot of trouble. But we managed to play good defense, and won. Winning this home games is a key factor. I feel great being back in this team, but the most important thing tonight is that we all did a great job, we were able to slow down Spanoulis." "We played horrible defense tonight. It wasn't good at all. We missed easy shots, layups... we just played horrible. We came here expecting them to do exactly what they did, play fast basketball, run the court up and down, we had to master that, but they beat us. It's still a long way to go, me personally, getting in and out. I think no more talking is needed, we just have to keep working hard in practices and get better."